This article was first published on AUT's Briefing Papers series. It is here with permission. Strong arguments, both philosophical and practical, can be made for incorporating a UBI into our tax-benefit system. But if our objectives include social security – ensuring an adequate minimum living standard for all and minimising poverty – then we will still need an effective social assistance system sitting alongside it. We don’t need welfare that is run the way it is at present – but we do need welfare and will continue to do so whatever the ‘future of work’ holds. Supporters of the UBI idea should not see this as a failure to grasp the full potential of a UBI, or as an argument against having one; it is simply that the utopian, ‘one ring to rule them all’ versions of the UBI cannot realistically be expected to achieve the multiple goals some claim for them. In particular, they risk doing relatively little to improve poverty, especially among sole parent families. The reason for this is the huge variation in different households’ needs depending on family structure, number of children, accommodation and other costs. 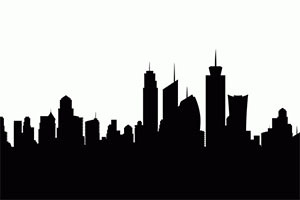 Picture this variation as an uneven city skyline with buildings of different heights. New Zealand governments have spent 30 years attempting to save money by tightly targeting the level of assistance to exactly match the height of each building. The result is a high rate of poverty, particularly among beneficiaries, poverty traps that make it hard for people to improve their circumstances, increasing numbers missing out entirely and complex mess of assistance measures that very few can understand, let alone fully access. However, a UBI that would do away with all that with a single instrument and adequately meet basic needs is the equivalent of providing everyone with a level of assistance that matches the height of the tallest buildings. A UBI set to the height of the tallest buildings would give too much to many, therefore be too expensive, and risk undermining work incentives. In this respect, Gareth Morgan and Susan Guthrie’s book, The Big Kahuna and its associated media publicity did a huge disservice to the New Zealand UBI debate. They put forward a world where there was no need for any welfare benefits, or even for WINZ itself. Indeed, their proposal was partly funded by savings from abolishing WINZ. Unfortunately their numbers just don’t stack up – at least, not if you care about the impact on poverty and child poverty. To give one example, the most generous version of Morgan and Guthrie’s scheme (a UBI of $11,000 per adult and $4,000 per child) would have resulted in a sole parent beneficiary with one child and no other income receiving $15,000pa. Even now, that family, if living in one of the main urban areas and getting full Accommodation Supplement, would receive $26,900 (and up to $1,820 more if paying higher rent in inner-city Auckland or the North Shore). Morgan and Guthrie put up a proposal that would have seen many of sole parent beneficiaries – as well as a considerable number of superannuitants and people with disabilities – worse off. Their suggested solutions to the problems their proposal creates for sole parents families (buried in Chapter 9) amounted to either privatising or undermining social security. These included making their ‘unconditional’ basic income conditional on parents taking out private life insurance; compulsorily docking the basic minimum for a non-custodial parent even though it was set as the minimum one person should have to live on; and suggesting that sole parents and others who cannot afford the rent should simply find cheaper accommodation. Their line is drawn across the skyline part way up; and the rest is just explained away. Several points come through from the table. First, it would not be too difficult to construct a UBI that does as well by couples, with or without children, as our current welfare system does. Note though, that unless they have other income, these household types are and would continue to be well below the lower 50 percent poverty line. Second, single adults, except in the case of multiple singles living together and sharing costs, would be below the current level of assistance (depending on their housing costs) and considerably below the poverty lines. 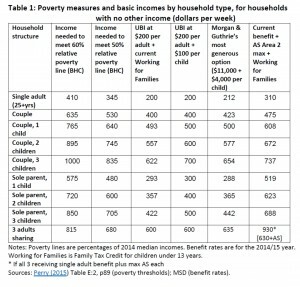 Third, sole parent households would fare particularly poorly, compared to both current assistance and poverty measures. Simply increasing the rate of the UBI could of course solve the adequacy problem for single people and sole parents. Doubling it to $400 per week ($20,800pa) would bring most sole parent households up to or above the 50 percent of median income poverty line. Perhaps a case can be made for a UBI set at around this level – after all the single rate of National Superannuation is presently about $18,500pa – but it would be dramatically more expensive and that case would have to take into account the disadvantages of higher taxes, and that many with lower housing costs would receive more than they need for as a basic income while others would still require additional assistance to meet essential needs. Even then, the end result is a level of income not much above the current amounts for sole parent households with no earnings. Once we accept that welfare assistance will need to continue to be part of the system, it is possible to see the directions real tax-welfare reform, potentially including a UBI, could go. For example, in a Briefing Paper published last week, Keith Rankin – easily New Zealand’s foremost expert on UBIs – pointed out that our current graduated tax scale pays an effective benefit of around $175 per week to anyone earning over $70,000 (where the top 33 percent rate cuts in) – so, if every dollar of income was taxed at 33 percent but there was also a $175pw UBI all those with incomes over $70,000pa would be unaffected. If the first $175pw of a beneficiary’s benefit income was renamed a UBI, and they had no other earnings they too would be neither better nor worse off. 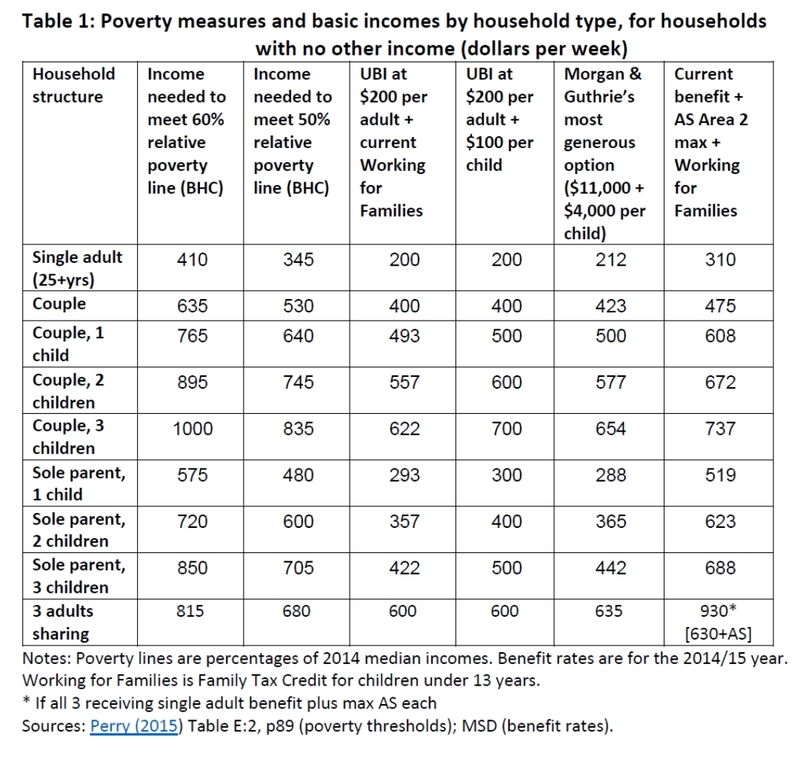 If this base was then combined with a) decent payments in respect of children, irrespective of their parents’ situation and b) a reformed housing benefit system that recognised all individuals’ housing costs (including children’s) then it may be possible to develop a 21st Century welfare system that minimised poverty and provided greater uncertainty in the face of fluctuating weekly earnings. It may also be possible to include within such a system the extension of ACC-like weekly compensation to those unable to earn due to illness and disability, thereby doing away with another of the inequitable anomalies in our current system. Our tax-benefit and social security system urgently needs radical reform. The current system is inefficient in its operation and ineffective in its outcomes, leaving many people, including children, in poverty. 1. The available after-housing-cost measures reported in Perry 2015 are based on deducting a 25 percent allowance from the BHC threshold, rather than on actual housing costs. Michael Fletcher is a Senior Researcher with The Policy Observatory and Convenor of the Social Policy Network at AUT. This article was first published on AUT's Briefing Papers series. It is here with permission. Personally I would attach the suplementary benefits to the children and never the adults, they are adults are'nt they? The exception would be adults with health issues, i understand. Would addiction count as a health issue? There are many addictions that society ignores, compulsive shopping, alcoholism for example. Business as usual I would guess.